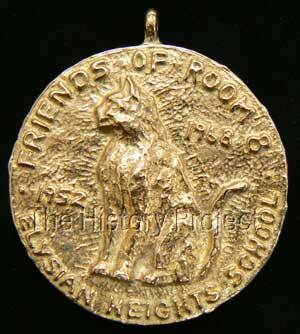 Description A gold colored medallion embossed with a cat image, "Friends of Room 8", "Elysian Heights School", and the years "1952" and "1968" on the front; embossed "Friendship Scholarship Knowledge" on the back. Brief History A cat, named Room 8 by students, showed up regularly at the Elysian Heights Elementary School for 16 consecutive years. 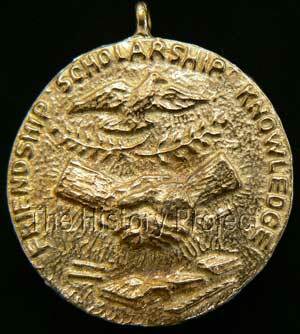 Acquisition Donated to The CFA Foundation by an anonymous donor, date unknown. 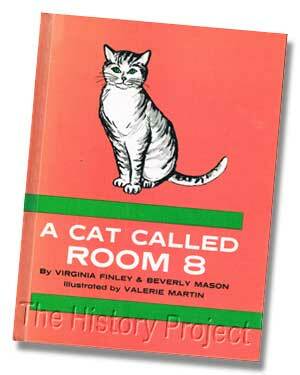 The name "Room 8" came from the room number of the class where the cat had made himself at home. He visited from desk to desk, and napped wherever he chose to. Children shared their lunch with him. When the school started a library, and needed bookplates, one of the students drew a picture of Room 8. Above right: Title page of A Cat Called Room 8, signed by the authors and illustrators, with Room 8 pawprint impression. 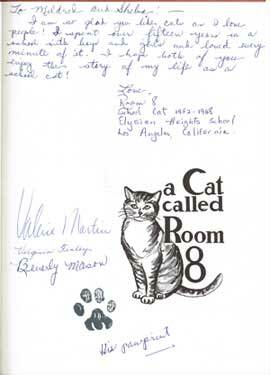 Eventually, stories about Room 8 reached the press and the school's cat became famous with articles printed in the Los Angeles Herald-Examiner, among others. TV channels filmed stories about Room 8 and he became known world-wide, requiring a student to act as his secretary to answer his fan mail. 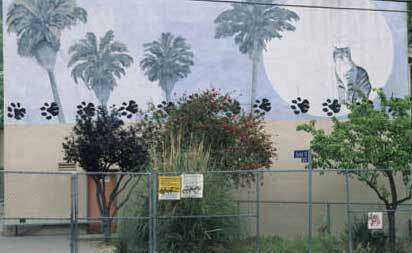 A mural memorializing a cat called Room 8, painted on the exterior of Elysian Heights Elementary School, 1976. Photo: ©Robin Dunitz. Used with permission.